I love Valentine’s Day, but I hate looking for culturally correct valentines for my sons’ classes. I have three of them, two are school-age and whenever I go out to look for Valentine’s Day it’s either white people or animals. Like us brown people don’t exist. So, I decided to make my own. My boys are really into superheros so I found some African-American superheroes, did some copy and pasting and viola! I made my own. Here’s what you’ll need to add these brown boy Valentine’s to your kid’s candy bags. Click here to print your cards. After printing you cards (there are 6 on each sheet) cut them all out according to how many kids are in the class. Then punch holes in the upper right hand corner of each card. Next fill your bags with candy. 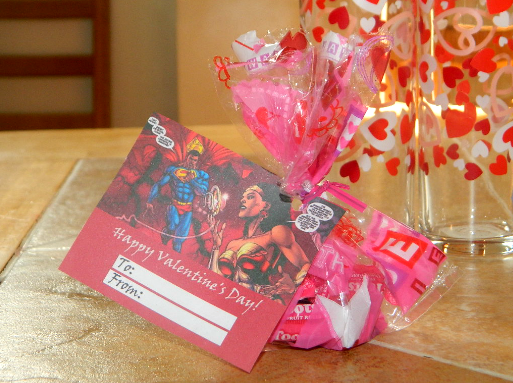 Then put the twisty ties through the hole in the cards and tie them to the candy bag. Lastly, I cut the tops of the bags off of the cards to make them look cuter. Viola! You’re done, and you’ve got culturally correct brown boy Valentines…lol. It’s that easy. If you have a daughter check out these brown girl Valentines on BrownMamas.com.